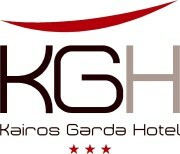 Kairos Garda Hotel, the brand-new 3 stars hotel located at Lake Garda. It is distinguished by its modern design furniture and its strategic position, just 2 km from Peschiera del Garda and its amusements Parks, 18 Km from Verona and 2 km from the highway junction. The hotel features 20 rooms (double rooms, three-bed rooms and four-bed rooms) and offers a wide range of complimentary services such as wifi, covered parking area, bike rental and gym. KGH is located just a few steps away from the Lake Garda Amusement Parks (Gardaland, Parco Natura Viva, Parco Giardino Sigurtà, Movieland, Caneva Aquapark) and offers discounted tickets. The nearby area is well known also for its bike trails and high quality Food & Wine itineraries. In the hotel you can enjoy a rich buffet breakfast as well as a drinks and snacks in the bar or in the terrace. At walking distance, a typical Pizzeria-Restaurant reserves special treatment to Kairos Garda Hotel’s Guests. Kairos features a Meeting Room with 60 seats.